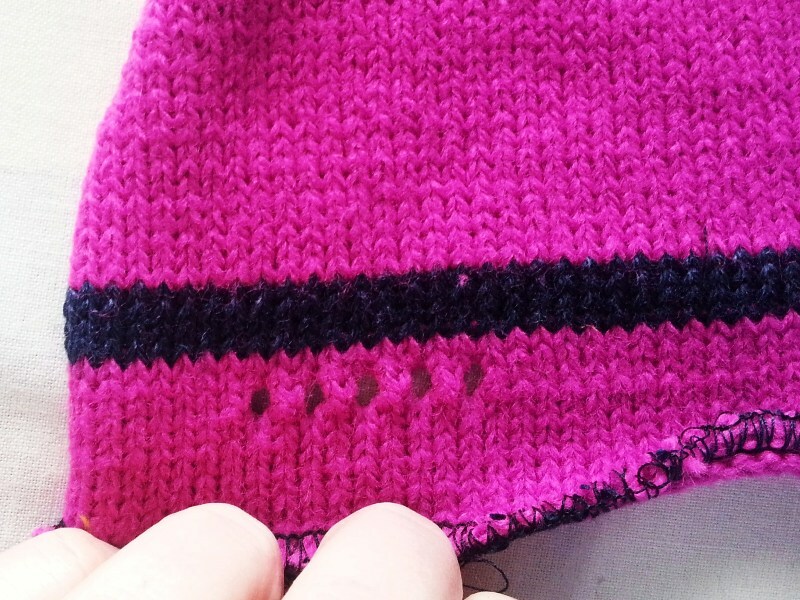 Beginner machine knitting – swatch it! Hi there:) I want to start with a thank you to Raphaëlle who blogs over at Deux Sourcieaux, who has nominated me for the blog hop that you’ve probably seen popping up in your blog feed the last while. 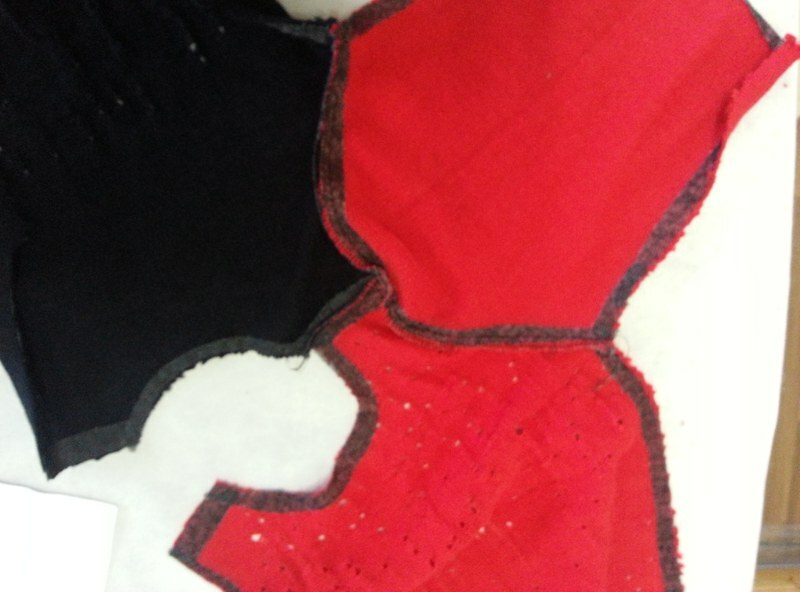 Raphaëlle’s blog has a lovely mix of sewing, some machine knitting and spinning ( one of the few textile pursuits I have never learned!) 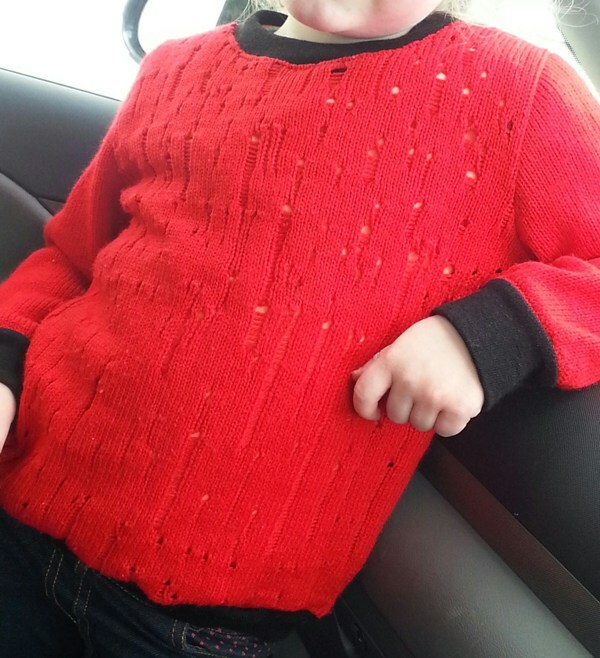 Her blog is a lovely source of inspiring kids clothes makes. So I will be posting my answers this coming Monday and passing on the nomination then, so do stop by again if you can ! Any other Machine knitters out there? I am slowly teaching myself to Machine Knit using a Knitmaster standard guage machine and I thought I would share some of the things I’m learning along the way. The most important thing I’ve learned is that swatches are an absolute must! Unlike handknitting it isn’t possible to judge as you knit. This is because in machine knitting, the fabric is stretched across the needle bed and changes shape dramatically when it’s removed. Below are some swatches that I made up after I purchased some new cone yarn from Yeoman Yarns in the UK. I bought some Cashmilon 4ply and Panama 4ply ( I used the Panama to knit my slouchy cardigan). 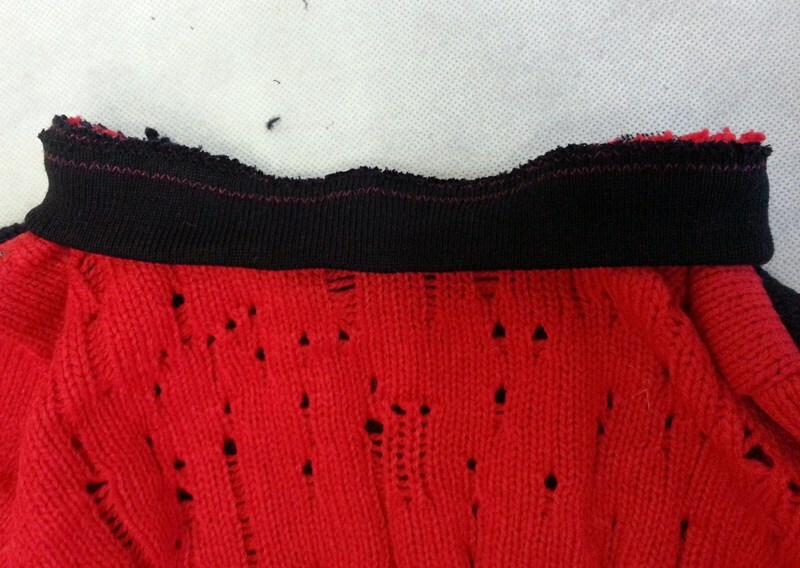 The contrasting dots of yarn are used to mark the stitch width and the contrasting stripes are marking the row count. 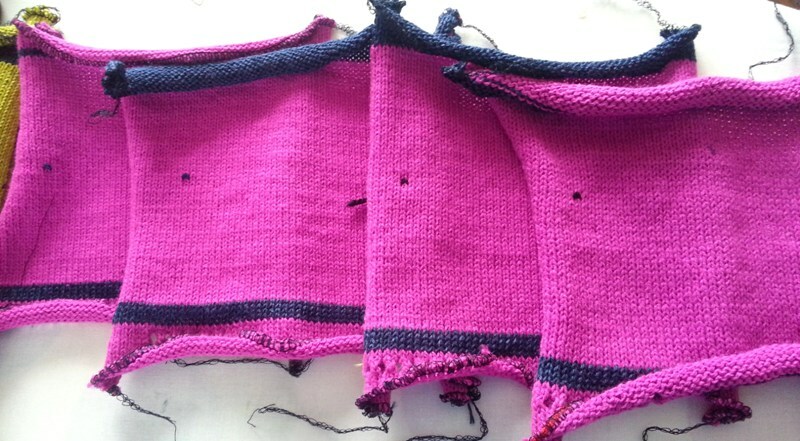 I knit them in a continuous strip to save on casting on and casting off. I used a different tension for each section. I then cut them apart and overlocked the top and bottom to stop them coming undone. 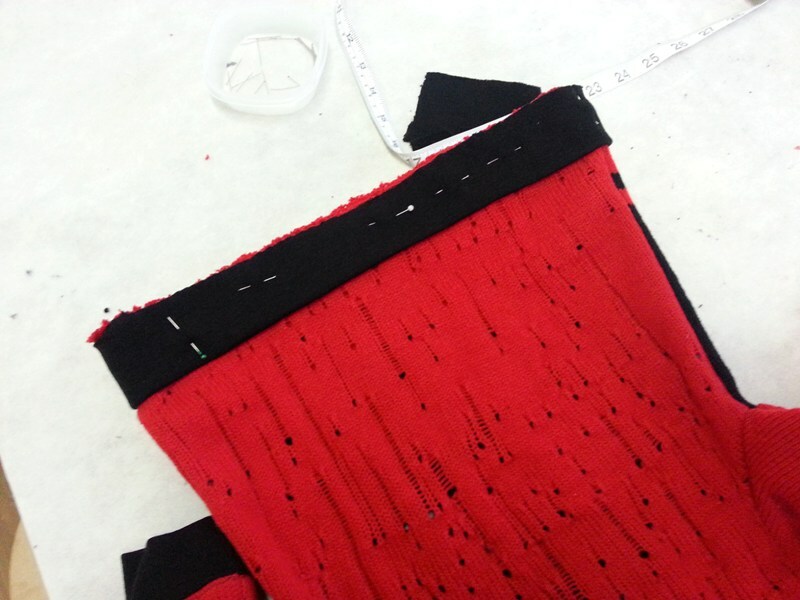 Nothing to post yet on my efforts with my OAL Dress…. lots of interuptions to regular sewing !! But I’ve had some pictures ready to post with a while so here we go…. I’ve mentioned before that I own a pretty old Knitting Machine which I’m slowly teaching myself to use. 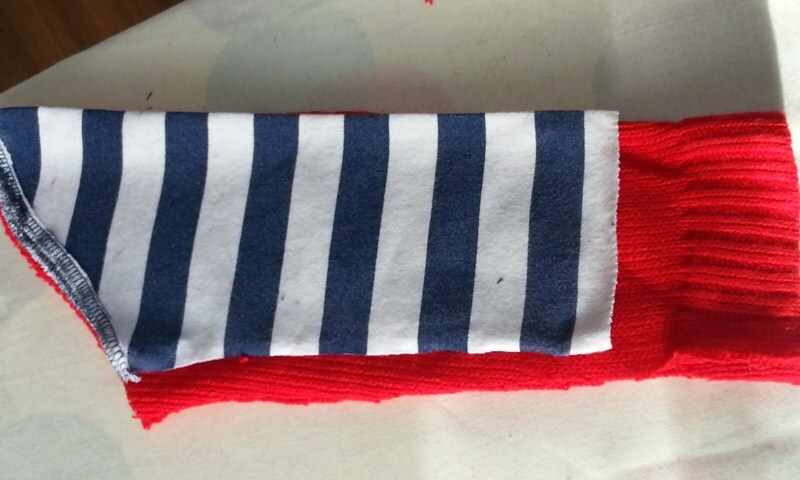 I have even made something very wearable!. But before that there were quite a few wtf pieces that will never see the light of day ( or blog!). But there is one such piece I am prepared to share, since I managed to salvage the remains! The neckline is a mess, the hem is a mess, it hangs away from the body stiffly and the sleeves were pretty gross too!! I made alot of beginner mistakes on this one. First up I didn’t make a swatch…. Big Mistake! 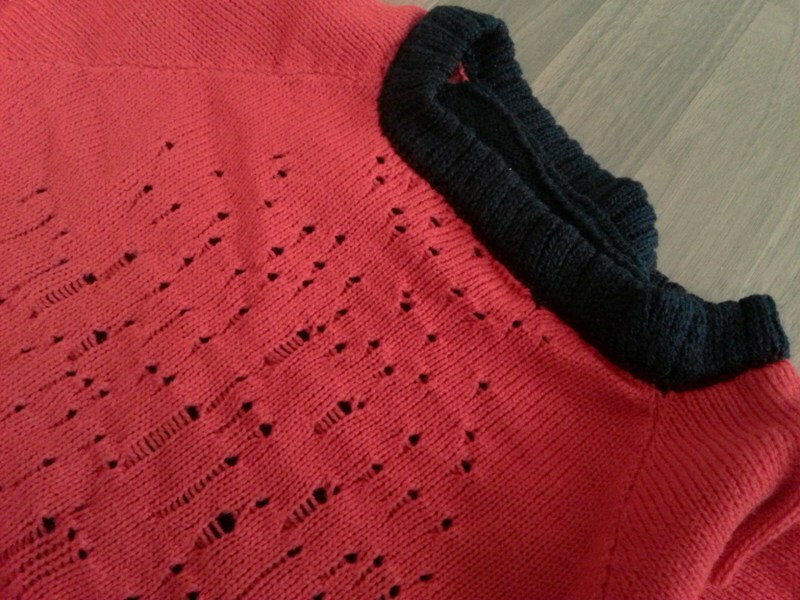 I ended up with a sweater that was stiff instead of draping nicely. 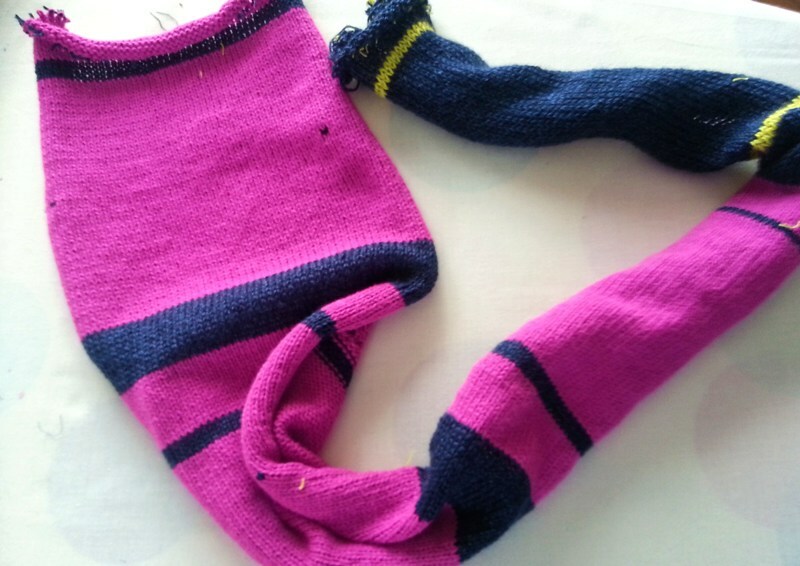 I had knit it too tightly, but thought it would soften up in the wash. It didn’t. 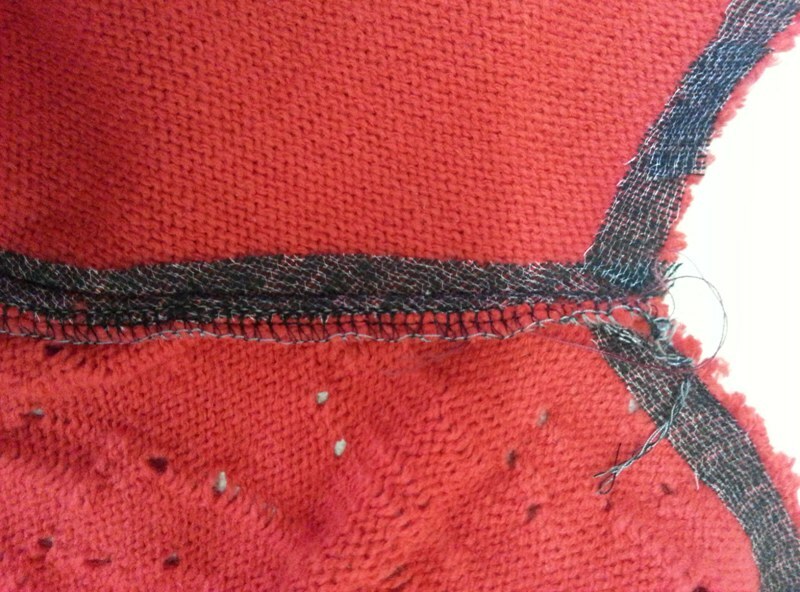 I also misjudged the sizing, so ended up with sleeves that were too wide at the top and just looked ugly. The neckline doesn’t bear mentioning, it was just wrong! But because I tried to fix my sweater by taking the sewing machine to the seams ( yep bad idea) I couldn’t unravel the yarn to be re-used. I know…. a real learning curve ha! 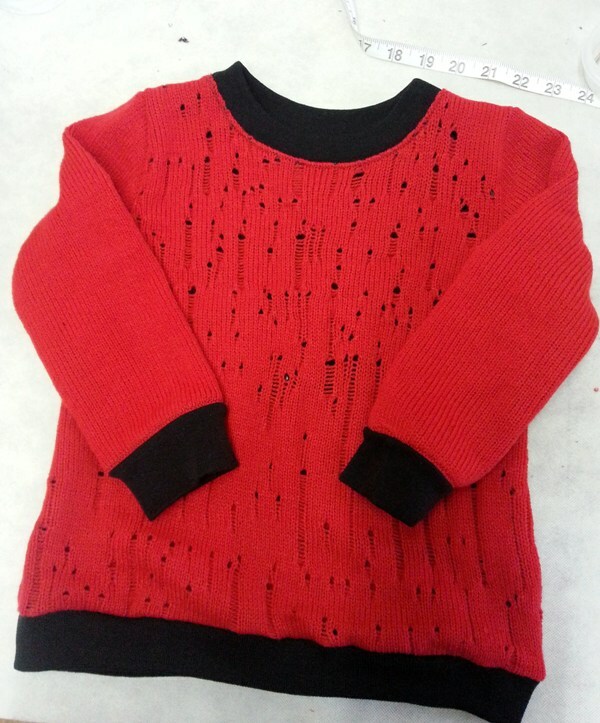 I follow a great blog that has lots of info on sewing with sweater knits call Crafting Fashion. 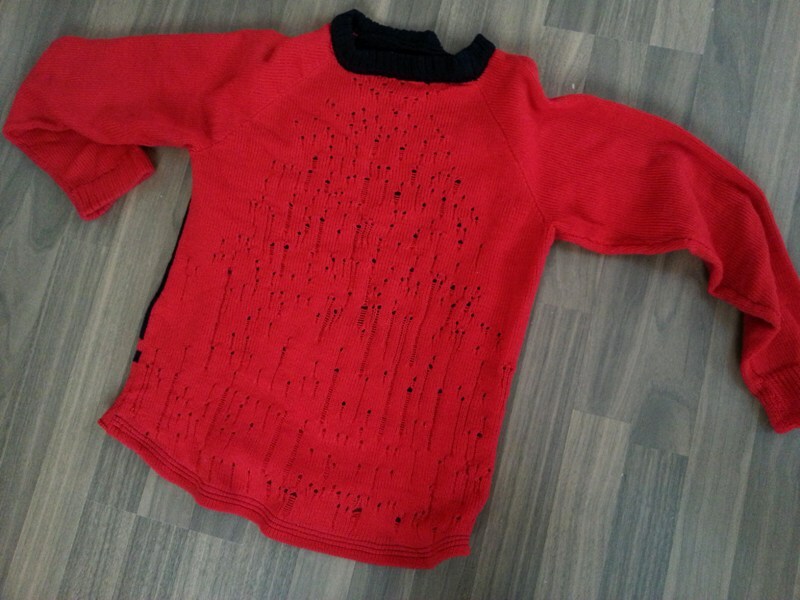 The designer Olgalyn Jolly knits the most beautiful sweater fabric that she sells online. So with a little courage that it might work , and knowing there was little to lose at this stage, I went for broke and cut it up to use as fabric…….! 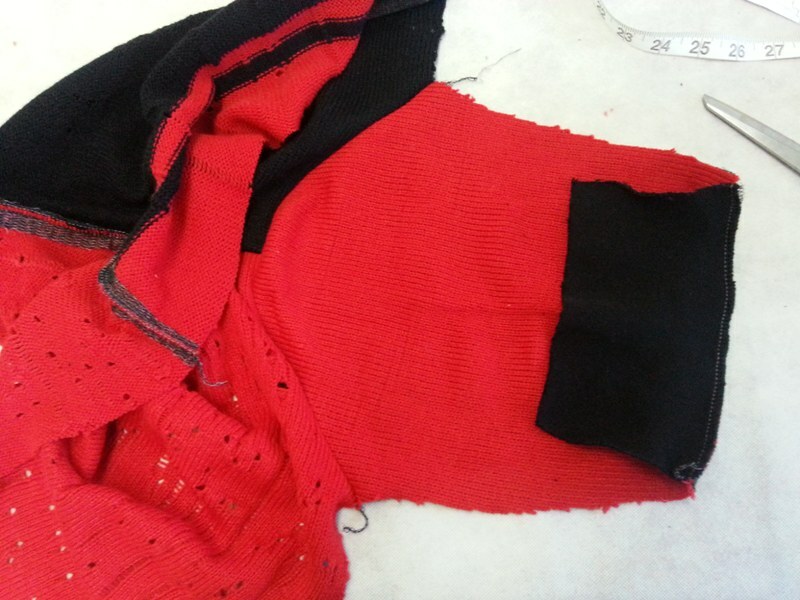 I then cut apart a childs sweatshirt to use as my pattern ( it was stained beyond saving ). It was a case of Bye Bye Kitty….. I might have mentioned before that I own a very old second-hand Knitting machine …..? I’m very much a beginner, but enjoying the process. This is one of the nicest things I’ve made on my machine. 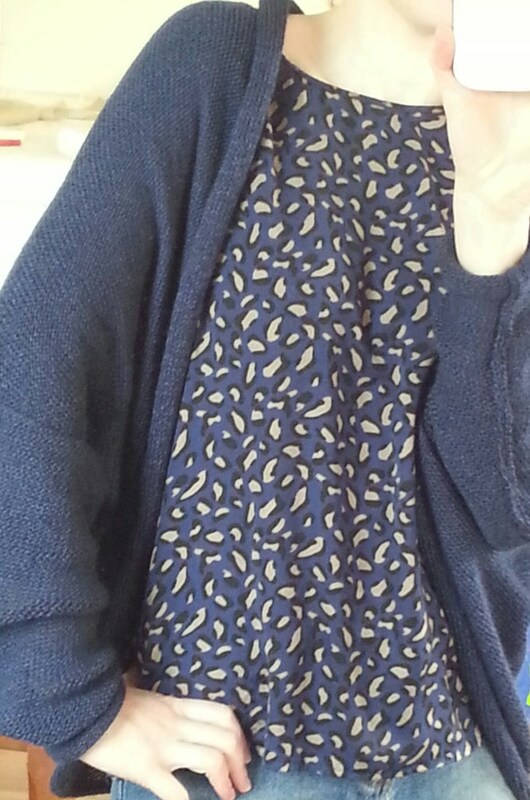 It’s a Slouchy Cardigan by Marianne Cant. 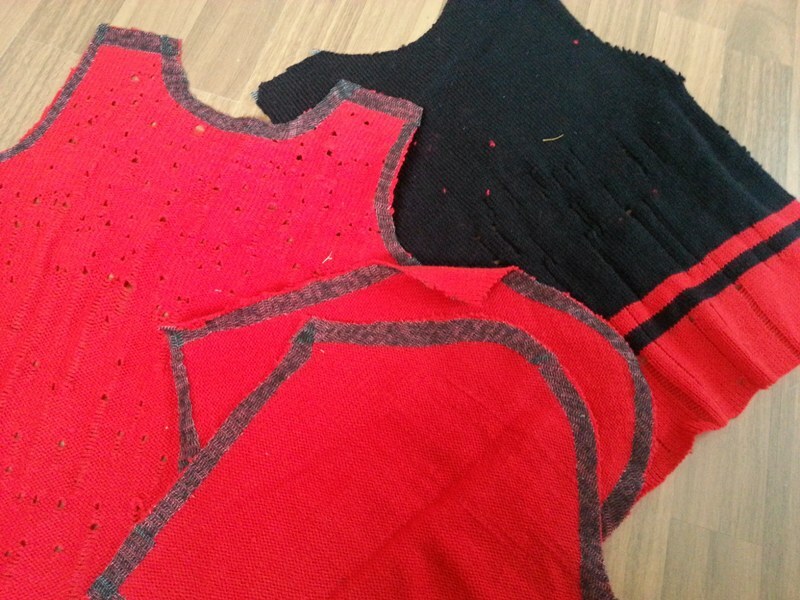 I follow Marianne’s blog Picperfic and fell in love with her design as soon as she posted details of teaching her friend to make one. * You need to know the type of yarn you will be knitting with before you purchase a machine. Eg – thin yarn like 2,3 or 4ply , dk , Aran, bulky etc. * My machine is a standard gauge, which means I can use thinner yarns. A mid-gauge would be for dk and also Aran I think, and then a bulky machine is for heavier yarns. * The tension dial is the opposite of a sewing machine – on a dial of 1-10 , 10 is the loosest tension and 1 is the tightest. This threw me at the start as I kept turning the dial the wrong way to tighten or loosen the yarn tension! * Gauge swatches are an absolute must !!! I learned this the hard way, after my first jumper was more cardboard than drapey! 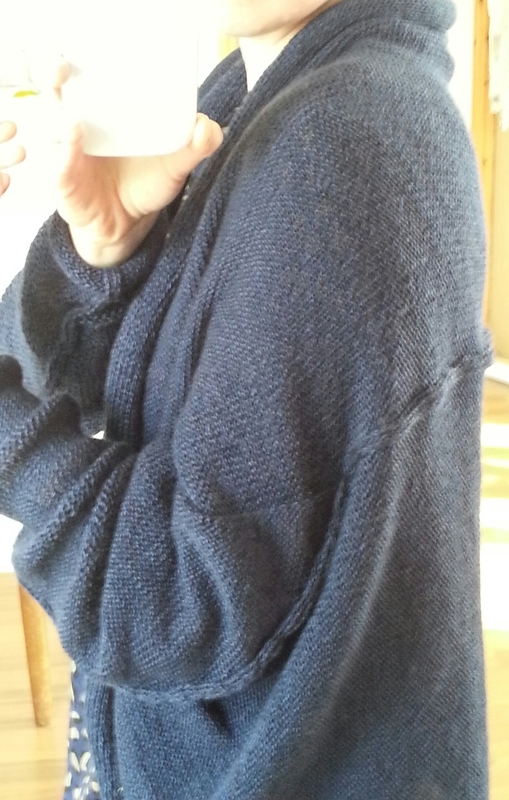 So back to the pattern in hand The Slouchy Cardigan on Ravelry here . It was exactly as described – an easy beginner project. 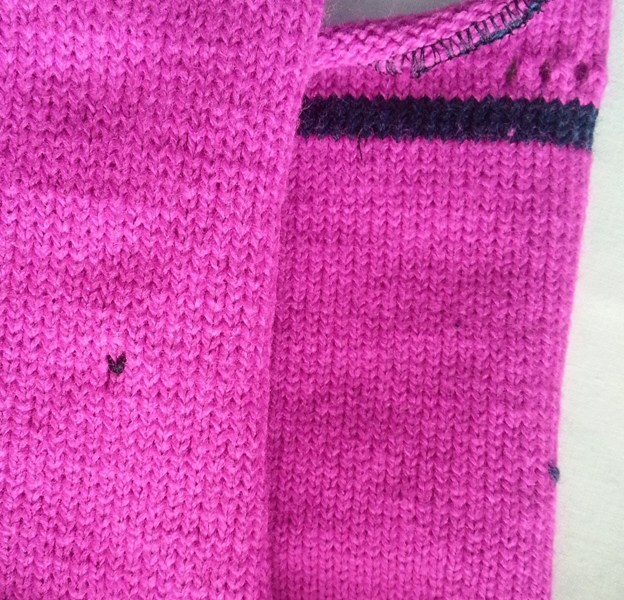 Because I only had 4ply yarn on hand, I did have to make slight adjustments. The recommended yarn ia a lace/ 2ply. 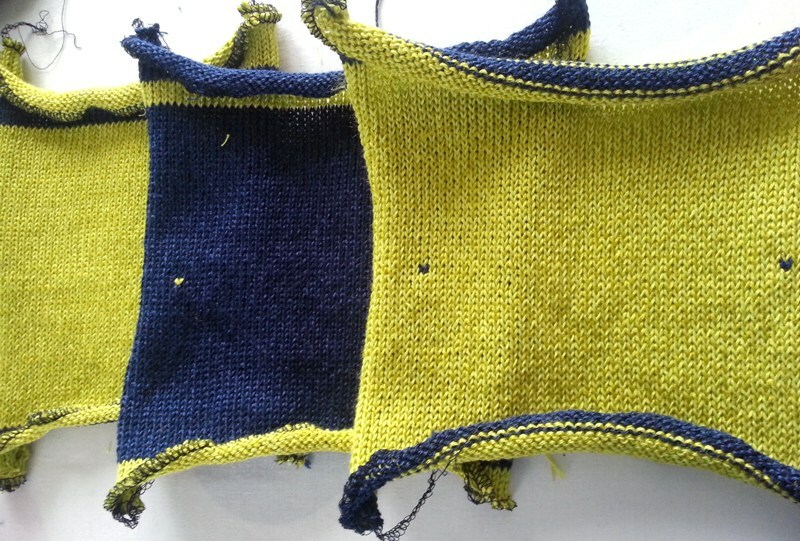 My stitch count was the same as on the pattern, but I was getting more rows than suggested. To allow for this I used the pattern row count and the finished garment measurements to work out how many rows I needed to do to get the correct length pieces. Once I had changed the row count on my pattern I followed the very clear instructions as written and it came together very easily. 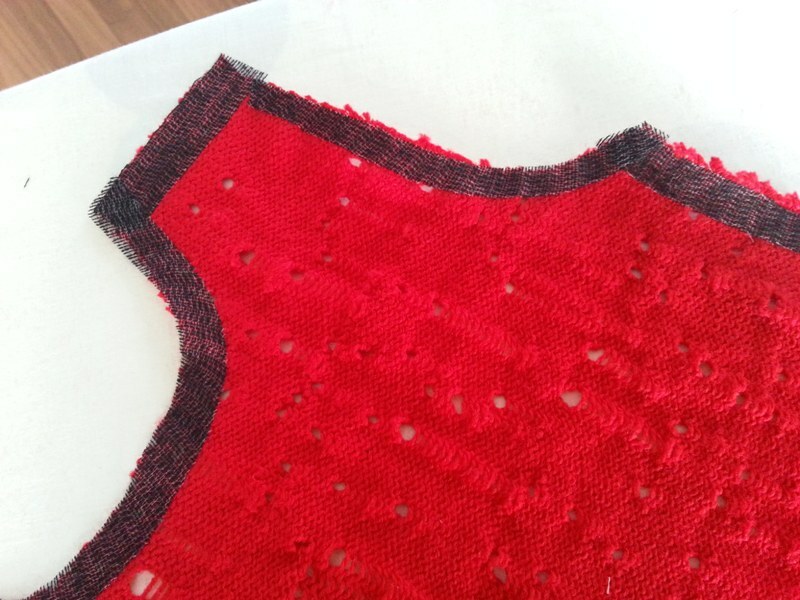 It really is a great beginner pattern – very little shaping or transferring stitches required, and an encouraging result which is always helpful when you are a beginner at anything. Marianne has also realised a Jumper (Sweater) Pattern called Ali’s Jumper which has been added to my knitting queue on Ravelry so I hope it won’t be too long before you see one appear here ! 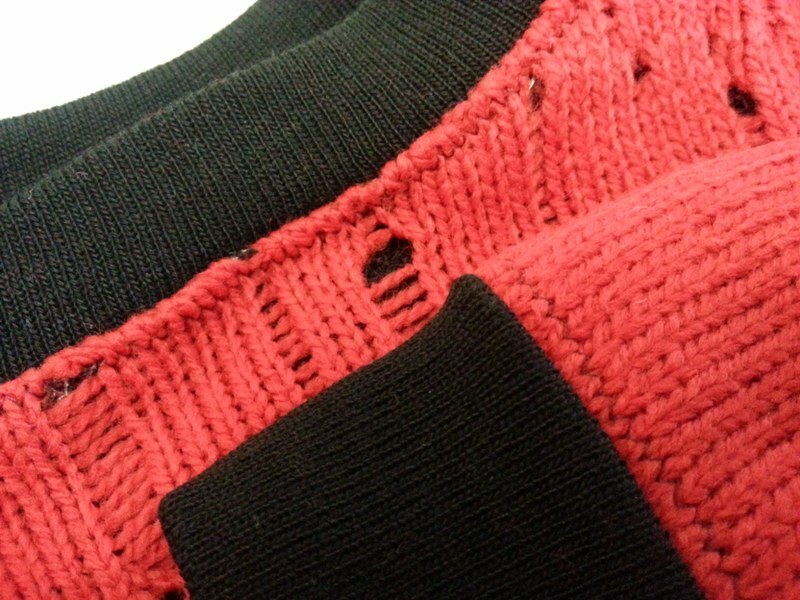 Has anyone else ever considered taking up Machine Knitting ?